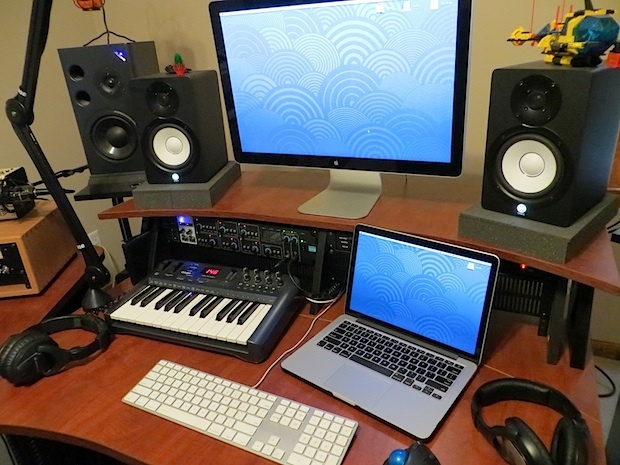 My Mac setup is used for audio production and front-end development. The Mac Pro is a monster of a production machine. I was a Windows user years ago because of financial limitations and because it felt really great to piece together your own machine. I made the switch to Mac when I discovered Core Audio and native aggregate device chaining (back when that mattered) and haven’t turned back ever since. You can have a listen to a few tracks from the studio here. The Macbook is primarily used for front-end development when I have the time. I love learning and making new things; and creating something from nothing, be it applications or compositions, always has my interest. My main machine is a 2009 Nehalem-based Mac Pro (2.66 quad). Though it’s five years old, I’m still impressed with it’s performance! One notable upgrade however was RAM and an SSD which made the Mac Pro feel brand new! I also have a 13″ Retina Macbook Pro that can be used for mobile recording but it rarely performs that function. I use other things too but the above covers what I use the most. I’ve used mics from Nuemann, Telefunken, Peluso and all the big names but I can tell you that sometimes a “cheaper” mic works just as well. For any aspiring musicians out there, a very important part is definitely the microphone but, in my opinion, a great preamp can really polish a less expensive microphone as well. CAD GXL2200 x2 (this is the exception, definitely not great microphones but I got a deal on them. I mic my little yamaha amp with one. Works nicely.). What are some apps that you use most often? 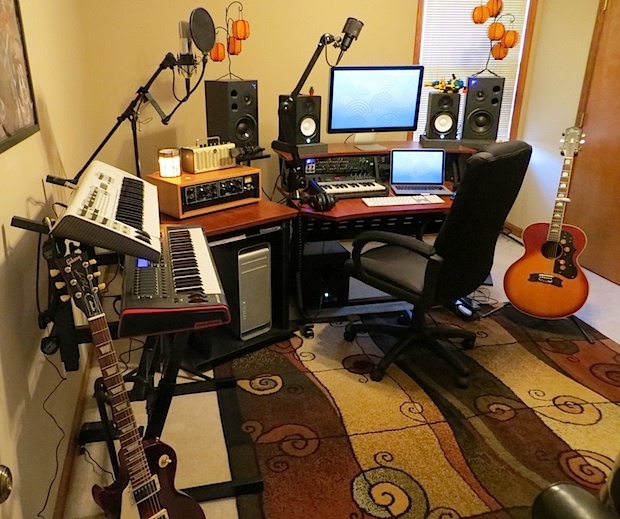 I use Presonus’ Studio One software primarily. I find it to be a great mix between Pro Tools and Logic which is great for a composer like myself. Paired with UAD-2 hardware from those lovely people at Universal Audio makes my current recording rig pretty powerful. Native Instruments is another company that I’ve handed over a lot of money to. They make some of the greatest Synths and Samplers on the market. Love those guys. I also use a lot of the common apps like Chrome, Transmit, The Dropbox App and some others. These little guys are indispensable! I can’t imagine getting the necessary chores done without these applications. Lastly, development requires only a simple text editor. I use an Alpha version of Textmate currently and it’s really becoming something special. When the final version is released, you can bet I’ll be picking it up. Do you have any specific tips you feel like sharing? I have one critical tip. When you are using Chrome, make sure that the “Warn before Quitting” option is ticked. I can’t tell you how many times I’ve closed the app before finally turning that little feature on. Do you have a sweet Apple or Mac setup you want featured on OSXDaily? Go here, answer some questions, and send us a few pictures! If you just want to browse through past featured setups, you can do that too. Whoa, now THAT is a setup. DO WANT! You do voice recordings with a Mac Pro in the room? Really? It’s completely quiet. Also, I have a ambient noise profile of my studio recorded with izotope. I use it to cancel out any ambient noise in the room. Works perfectly. Check it out if you have a noisy space. The setup is fine but this is just semi-professional. Call me a killjoy but I think someone should say this loud and clear. who cares….i’ve heard music come out of bedrooms that sounds as good as any that’s ever come out of abbey road studios…. Hey it’s all good :) to each their own. When you work by yourself, you can make whatever setup works best for you. That’s the joy of being a creator. What kind of speakers are those? How about the headphones? I’m not much of a musician but I love good sound, and there are few better people to recommend quality output than the pros. By the way I know these articles usually link to more info about the items shown, for like Amazon and other places to check them out, but this time they aren’t there… would love to know more about some of this stuff if you can do that again. Maybe I’m the only one who misses that! Oh man I forgot to mention the headphones. The main headphones I use are Sennheiser HD280 Pros. I have some other pairs from Sennheiser but I don’t use them often. Speakers are from Yamaha. They are the HS50m series but they aren’t made anymore. Now they make the HS5. Very similar. I also have them coupled with the Yamaha HS10w sub to exhibit the true lows I need for mixing. If you are interested in knowing why I chose the HS50m’s it’s because the supreme pro studios use Yamaha’s legendary NS10 speakers (discontinued now). They are passive though and I wanted an active solution meaning the speakers have their own amplifiers built in. The other speakers are from Alesis. M1 mkii’s. Not the best but great for switching back and forth and seeing how your mix translates. Sweetwater.com is a great resource for gear, reviews and explanations of equipment. The guys there are very knowledgeable as well so you can call with questions. Feel free to head there and look up some of this equipment. 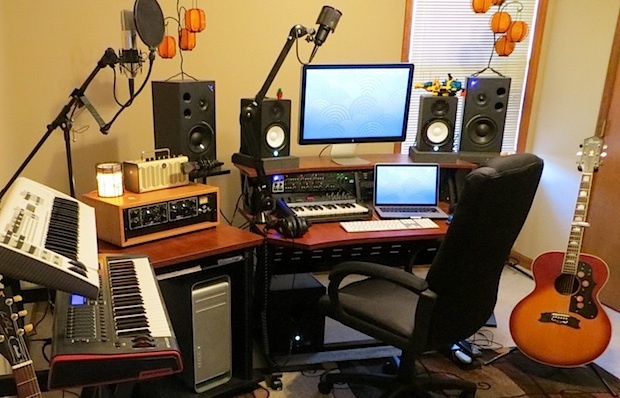 Don’t get me wrong: This is a great home recording studio and I would choose it over many, many others I have seen in all these years. It’s an elegant semi-pro setup. Great setup, Nathaniel. Lots of unique hardware, with tons of talent on your part. From the selection of music in the link, my favorite was “Capo Way Up” because it feels like something that would be nice in an Apple commercial. How did you go about making that particular song? Nice setup, Nathaniel. I use Pro Tools, but would like to wean myself of it. Based on your comment, I’ll have a look at Presonus. Personally, I prefer at AT 5050, but the 2020 is awfully good, too. I have a couple of vintage U87s that are great, but the Audio Technica usually stands in their place for VOs. Judging from the way your axes are strung, I’m guessing you’re a southpaw, yes? I used Pro Tools a lot since that is what we had at my regular job, but now that I work full time for myself, I picked what I preferred and it was hands down Studio One! Keep your PT and download the trial of Studio One v2, it’s fully functional! You can set the key commands to pro tools as well. Helpful indeed. I’ve never tried the 5050 but a good friend of mine had the old 3035 which I loved. The 2020 wasn’t far off (they had stopped making the 3035 by then). I like the AT for voiceovers because though they are more sensitive than a dynamic, they still have the bold qualities of what I love about dynamic mics. I’ve placed a few neumann’s in my cart a few times but have never had the guts to checkout yet! I do plan on picking up a pair of km184’s for my acoustic guitars eventually. Haha yeah I’m a southpaw. The concord was my dad’s guitar. I have it restrung of course but the Gibson and the Taylor are true lefties. Good to hear your comments! Keep playing as well!